What do you do for your undergraduate research? For my research, I work in Dr. Almeida's lab, analyzing cytolytic and cell-penetrating peptides. I use the Circular Dichroism machine to determine the percent helicity of a peptide by labeling the peptide with Rhodamine, which can be used to estimate how well the peptide will bind to the lipid membrane. Understanding the binding efficiency of these peptides will help target cells for gene therapies and other medical purposes. What made you want to pursue an undergraduate research project? 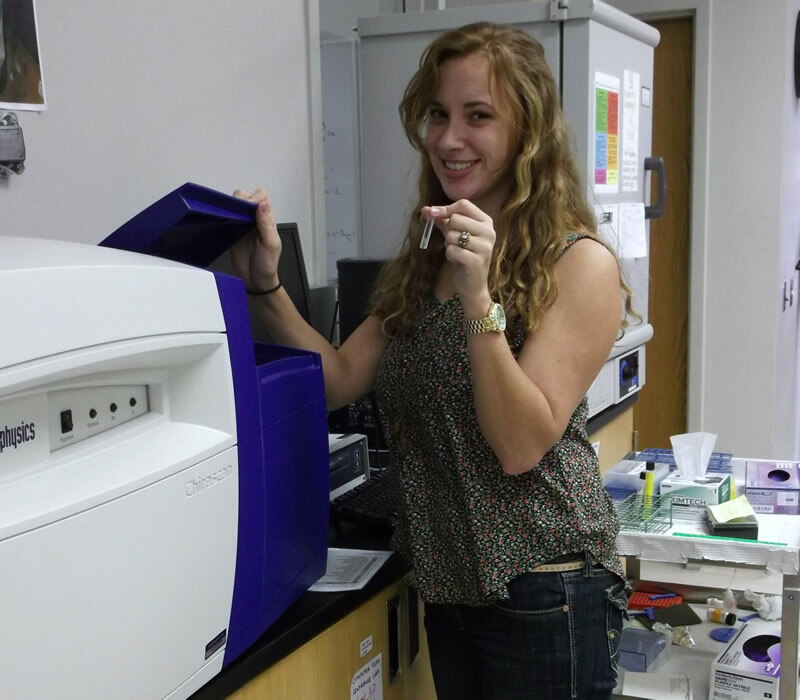 Before coming to UNCW, I knew I wanted to do biochemical research. After I took an introductory course to Dr. Almeida's lab, I knew doing research was what I wanted to do. Although it does fulfill my Hono's College requirements, pursuing an undergraduate research project will help me prepare for the future and I will gain experience that will be helpful for when I do my own research. How did you start your research project? During my fall semester of Sophomore year, I knew I wanted to do research and at that time I was taking Dr. Almeida's Organic Chemistry I class. I really enjoyed the class and a classmate who was already working in his lab invited me to do an introductory course into the lab. Taking time to being introduced into the lab was a really great idea, because I was able to learn techniques and skills relevant to my research before even starting my project. Was doing your own research fun? Be Honest. Of course! Yes, it can be challenging at times, but it is satisfying when I do my research and I get amazing results. Everyone in the lab is very helpful and I am thankful for their support. Having done my research, I realized how passionate I am about doing research. It isn't required to do research as an undergrad, so what advantages do you think this experience has provided you? As undergrad, doing research helps you prepare for grad school as well as future jobs. Many people do not know what they want to do when they graduate, but working in a lab can give you an idea of what you like to do. I know for me, doing research and being a part of this lab has further enforced my goals of continuing research. What recognition and/or grants did you receive for your research? I received a CSURF Research Supplies Award. What are your plans after you receive your degree from UNCW? After graduating with a B.S. in Chemistry and Biology, I plan to pursue a M.S. in Chemistry and continue doing research. Click here to view more Research Stories!